Until recently Takara was attending Lin San's music appreciation class for 2 to 4 years old, Musik Garten method, with Jason. Arata tried Lin San's older children's class and also the one taught by a teacher at St Christopher's. Both are music appreciation type of classes but for some reason, he didn't like them much. 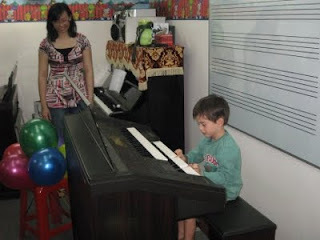 As he insisted to go to learn at Yamaha music school, where he also did a trial a long time ago, we decided to send him there. Yamaha's classes are more like a music class at school. Each child has an electone in front and a grown-up has to stay with them. I don't know what attacts him, the way they are teaching, or the fact he can take lessons with me? We had a class party today. 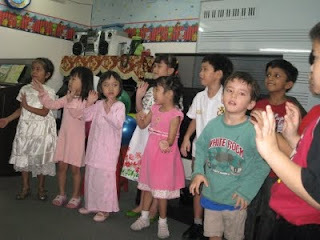 All the children sang together in front first, then everybody has to play a piece on his own in front of us. Arata chose 'Tug of war'. When he sat at the electone, he looked so confused and didn't start. I was a bit worried. But once he started, he played perfectly. He arranged the piece in his own way. He played it with both hands.